The US is a vast and varied country. There is a lot to see and do. A lot of people that live here love to camp and explore the great outdoors. There are a lot more national parks and reserves to see than you might think. So if you are planning a hiking trip, where are the best places to visit? It can be difficult to know where to start, especially if you are coming from abroad. Locals have friends and family recommendations that they can go on. So if you are coming from abroad, I have got some advice for you. First of all, check out a page like https://www.trails.com/toptrails.aspx. It is a great place to start. It will narrow down your search of the areas you want to be in and the distances that you want to travel. Remember if you are coming from abroad, you need to have the necessary visas in place as you plan your trip. You will most likely need an ESTA visa for the time you are on vacation. You could look at https://www.official-esta.com/our-services for any questions that you might have. But anyway, here are a few of my ideas to help get you started on deciding where to go. I think one of the most obvious hiking trails that are known worldwide is the Grand Canyon. If you have never been in your life, it needs to be on your bucket list! There is so much to explore, and it is a stunning area of the world. It is a mile deep which is pretty epic to hike in. You can also hike around the top of it, too. There are a few awesome national parks in Utah. One of the best has got to be Zion National Park in southern Utah. There is a river that runs through it which is great if you feel the need to cool off a little. The river leads to an area called Emerald Pools that is full of waterfalls. It is a beautiful area to hike. This national park is set in the Californian Sierra Nevada mountains. It is the park most known for its giant, and I mean giant, Sequoia trees. The ancient trees stand proud, and it is pretty epic that you can close to such historical lifeforms. It isn’t too far from Sacramento and San Francisco in California. So if you do want to experience some of the USA’s great shopping and burgers, you can while you are close by! This park straddles the border of Tennessee and North Carolina and is one of the greatest national parks on the east coast. The forests are lush, and it is full of amazing flowers all year long. There are of course streams and rivers that follow along the hiking trail. It is one of the prettiest national parks that you could visit. Hope you enjoyed this collaborate post! While I have only seen a couple of the parks listed above, stay tuned as I return to some of my favorite national parks and visit new ones, too! My recent guest posts took me all around the world! If you’ve ever been to Disneyland or Walt Disney World in the United States, you may wonder if it’s worth going overseas to international Disney parks. Even die-hard Disney fans may want to stick to the original two! When I went to Disneyland Paris, I was pleasantly surprised with the outcome! 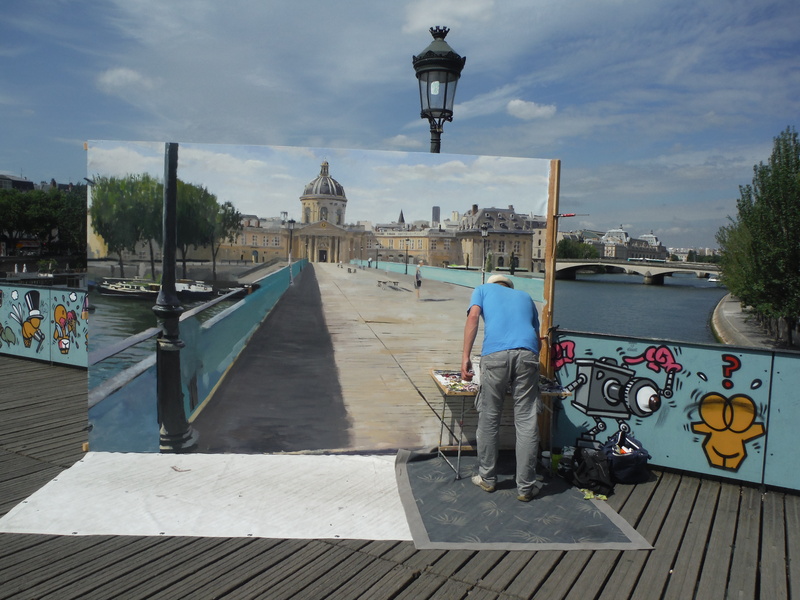 Do you have a tourist attraction near where you live that you just haven’t visited yet? I’m not above playing tourist in my hometown. I’ve enjoyed historic Jacksonville, hiking places like the Table Rocks, and even Harry & David (although I enjoy that last one less since I worked there). But one attraction I just haven’t made it to is also one of the most widely known: the Pacific Crest Trail. I got to explain why in this collaboration with other travel writers. Do you think what I said was a good reason, or just an excuse? I will try to hike the PCT soon. (Not the whole thing; just the part near me.) I’ll let you know what I think when I get there! A little over a year ago, I made a stop at the historic Butte Creek Mill. It hadn’t changed much since it opened in 1872. Christmas morning brought many surprises as usual, but an unexpected and unwanted surprise was hearing the news that this beautiful historic mill caught fire. It was shocking to comprehend that something that had stood the test of time had so suddenly disappeared as it literally went up in smoke. In the following weeks, residents from my area kept up on the news of what would happen to the site where Butte Creek Mill once stood. I was filled with hope when the owner announced that just enough survived to justify rebuilding and restoring the mill. However, it would take a lot of help. I made a small donation within the month of the fire, but after seeing the burned-down mill with my own eyes, I recently made another donation. You can help rebuild Butte Creek Mill, too! I look forward to the day when Butte Creek Mill once again resembles the top photo! Two Days, Two States, Two National Park Sites! It has been quite the weekend! In addition to Earth Day on Friday and celebrating the entire weekend with Earth Day-themed posts, I was out celebrating nature as well! Just between yesterday and today, I took two trips, both to National Park Service sites. And one of them even called for hopping the border between Oregon and California! For several weeks, my friends and I have planned to go on a trip to Northern California this Saturday. We were supposed to go to the Redwoods, but people and plans changed, so my friend Steph and I made a last-minute switch and headed to Lava Beds National Monument instead, which is east of the Redwoods in Northern California. Although both of us had been here many years ago, with the length of time since our last visits and flying by the seat of our pants, we weren’t sure what to expect. Yet we left incredibly impressed with all that there was to do! We admired all the volcanic rock we passed on the way in the monument. We watched an informational video at the Visitors’ Center about the history of the lava tube formation and American Indian tribes that were forced out of this area. A park ranger taught us about the white-nose fungus that is killing bats and quizzed us on our past caving experience to see if any of our clothes needed to be decontaminated. Once we passed, she gave us a caving permit. Since caves are 55 degrees year-round, I was glad I had left a coat in my backseat! We ended up getting warm from all the exercise we did, anyway. Although the Visitors’ Center loans out free flashlights since battery-powered lights are required to enter the cave, we decided to use our cell phone flashlights just so we’d have one less thing to lug around. I learned that my phone flashlight turns on and off by shaking it. Typically I might think that was convenient, but it wasn’t so helpful when I stumbled around caves! One of my favorite cave names was called “Hopkins Chocolate”, which is named because some of the lava coating inside looks like dark chocolate is dripping down the cave walls! There were other neat-looking things in other caves. Some of the caves had what looked like moss growing on it. (Not sure if it was something living or just the way the rock was colored.) When scattered among the dripping moisture creating stalactites, shining a flashlight on it makes the green specks look like fool’s gold, and the white looks like specks of silver! The next time I go, I’ll probably want to bring a helmet, a headlamp, and maybe gloves so I can go further into some of the lava tubes. Since we weren’t equipped, we decided not to go anywhere that required crawling, but there were quite a few areas that involved ducking down! There were some nice places to walk, too! Both Steph and I really wanted to hike up Schonchin Butte, a .7-mile uphill trail that leads to a fire lookout. The lookout itself is closed for the season until tomorrow, but we got some great views! Although there was so much more we could have done, we decided that the last activity for the day would be to walk around Captain Jack’s Stronghold. This was an area where the military fought against the natives to force them out of this area. Although the history is sad, it was neat to see some of the rock structures that they built that are still standing today. I had so much fun on Saturday, I decided to continue the National Park and volcano-themed weekend my closest National Park, Crater Lake. Since this wasn’t as long of a drive, I decided I could make it to church (although I did attend the 9 am service instead the 10:45 service I normally go to), and then head out. With only slightly more planning today than yesterday, I ended up going alone this time. I went to Crater Lake almost exactly a year ago, and it was so odd to see how different it looked this year! It was already a rainy day, and I was praying that it wouldn’t rain while I was at the park. That prayer was answered, but not in the way I expected! As I crossed the park boundary line, I noticed that all the trees were covered in snow. In fact, it was actively snowing most of the time I was there! It’s late April! My first stop was the Visitors’ Center, where I watched the video about the surrounding nature and how Crater Lake was formed by a giant volcano eruption followed by years of collected rain and snowfall. I had to enter and exit the Visitors’ Center from the side entrance because the front entrance was covered with snow all the way up to the roof! I then drove up to Rim Village (being careful in the Avalanche Zone), and parked next to the lodge. After browsing the gift shop in the lodge, I went up to the top floor, which is supposed to have an observation window. Maybe it works on clearer days, but with all the snow and clouds, it was impossible to see the lake from here! Instead I read the museum-style informational signs. I decided that the only way I would have a chance at seeing the lake was to walk through the snow myself. Fortunately, I still had my coat in the back of the car, although I definitely would have benefited from more winter gear! I followed the others who were also outside to the farthest point that could be reached without crossing the safety line. As I looked out, I could barely see Wizard Island, the large island in Crater Lake. After a few minutes in the cold, the air cleared up for some precious seconds where we got to take pictures. It still didn’t display the bluer-than-blue color I’ve seen on sunnier days, though! I warmed up in the lodge for awhile longer, when a park ranger told me to look out the window. You could barely make out part of the back rim, but he said that was the clearest it had been all weekend. Yesterday they basically couldn’t see the lake at all! I went out to the safety line for one more photo shoot, but then decided to turn back and head home. In the summer you can usually drive around the whole lake, but since it snows year-round at Crater Lake National Park, they limit their snowplowing in the winter to only the roads to the South Entrance, Visitors’ Center, and Rim Village. On the way back, I stopped for a short walk by Union Creek. My family used to go camping there when I was a kid. I walked by the Rogue River Gorge and saw the Living Stump! My family had a dinner all together tonight, and since I knew my sister had gone to Crater Lake National Park last weekend, I asked her how well she could see the lake that day. She looked at me confused as she told me it was a perfectly clear day and that many of the visitors were wearing shorts! It’s funny how much the weather can change from one week to the next! Hmm…good question! I had been admiring the National Parks Passport for some time now, and finally decided to purchase one at Lava Beds National Monument. This is an informational book about all the National Parks in the United States. Every time you visit a National Park, Monument, or Historic Site, you can get a page of the passport stamped. Since I knocked out two parks in just this weekend, I already have two stamps! Now it will be used as encouragement to visit more National Parks. The Oregon Caves National Monument is fairly close to me, so I may go there sometime soon. Of course, we need to reschedule our trip to the Redwoods that we had originally planned for Saturday! Although we were going for the Trees of Mystery and the Tour-Thru Tree, I can stop by a Redwoods National Park center for a passport stamp. Although I would love to become a National Parks junkie, it was really only financially possible for me to visit two National Parks in just one weekend because it was part of National Park Week, and the National Park Service allowed all parks and monuments to have free entrance. Normally Lava Beds and Crater Lake each have a $15 entrance fee per car. I would definitely love to take advantage of the upcoming entrance days in August, September, November, or any of the other free days listed here. To save money on National Parks in the future, I may consider getting an annual pass (I can’t wait until I’m 62 and can get the discounted lifetime pass! ), or I may try to find out which of my friends have a fourth-grade child, since a car with a fourth grader in it can enter National Parks for free! Some National Parks and Monuments are always free, which thankfully, the Oregon Caves and Redwoods both fall into the free category! I have visited two Parthenons. What, you didn’t know there were two of them? You’re probably aware of the most famous Parthenon sitting atop the Acropolis in Athens, Greece. I visited that one a few months ago as part of my three-month Mediterranean Trek. But this wasn’t the first Parthenon I’ve been to. Several years ago, I took my first “official” solo trip to Nashville, Tennessee. Like most visitors to this city, I enjoyed the music scene, but I also explored other elements of Nashville, like its history, its Bible belt Christianity, and its parks. Yes, Nashville has some excellent parks that alone may be enough to warrant a trip! There’s the huge Bicentennial Park, the Riverfront Park along the Cumberland, and Centennial Park. The centerpiece of Centennial park is a full-scale replica of Athens’ Parthenon. Seeing this Parthenon is what initially motivated me to visit Greece. Although Tennessee’s Parthenon is a copy of the one in Greece, each have their own unique characteristics. If you’ve seen one, you may want to plan a trip to go see the other. If you have yet to see either, maybe this comparison will help you decide which to see first! Athens: Obviously, Athens’ ancient Acropolis and Parthenon has a long, rich history, so I’ll just go over some of the highlights that makes it what it is today. The Parthenon was built in ancient Greece as part of the Acropolis, or “City on High”. However, it wasn’t actually a city, but a mountain in the center of Athens where several temples were erected for various gods. The biggest, the Parthenon, was dedicated to Athena, a goddess who is the virgin patron of her namesake city. After thousands of years, the building is understandably in ruins, but some events, such as thievery and an accidental explosion when it was used for military storage, left it in even further shambles. Nashville: The Parthenon’s replica was one of many buildings constructed on a piece of acreage in celebration of the city’s 100th year. The land aptly became known as Centennial Park. If you visit today, the only building you’ll find in the park is the Parthenon. What happened to all the other buildings? All of the exposition buildings were made to be temporary, but Nashville citizens fell in love with their version of the Parthenon. They protested until the city officials decided to make some structural adjustments to the Parthenon so that it would stand the test of time. Behind me is another temple dedicated to Zeus. If you look in the background, you can see that the Parthenon is visible from most other ruins. Athens: The Parthenon is located on a hill called the Acropolis, in the center of downtown. Back in the day, it was a convenient reminder for the Greeks to pay respect to their religion, especially since they could only travel by feet or chariot. Today, it makes it conveniently located for travelers, who may not even need to take the subway to reach it! I stayed at two hostels in Athens. Most of my time was spent at Athens Backpackers, but one night was spent in AthenStyle. Both of these hostels had a rooftop lookout where you could see the Parthenon, which was especially beautiful lit-up at night. During the day, it was just a short walk (albeit uphill) from both of these places to reach the entrance. Nashville: Because this park was created one hundred years after the downtown area was established, it’s a couple of miles away from other city sites. That doesn’t mean that the Parthenon isn’t accessible, though! Since many people drive to Nashville, they will appreciate that it’s much easier to park here than it is in the city center. I did not visit with a car, but there were several days when I would walk both in the downtown and Centennial Park areas. I stayed at Music City Hostel, which was at an ideal location between the Parthenon and other Nashville attractions. Athens: As mentioned above, the original Parthenon is in disrepair. However, there are people working on its preservation. 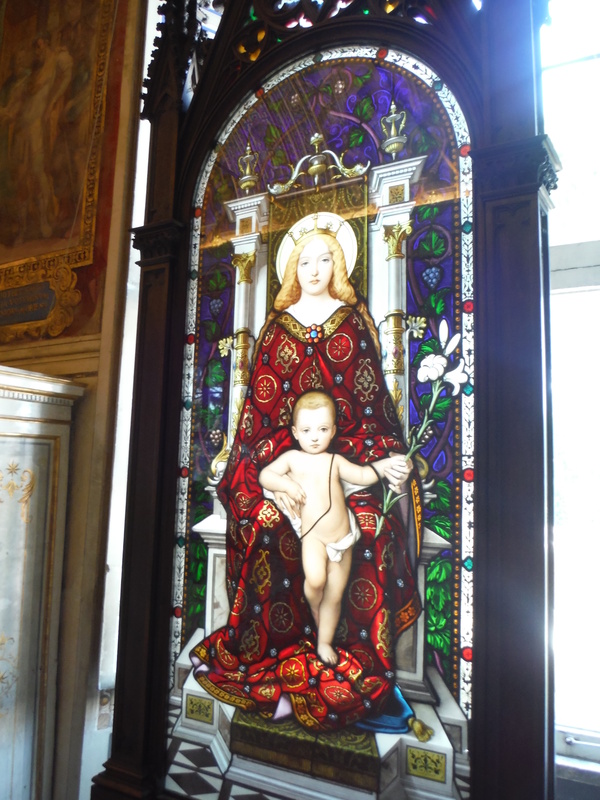 Many of the original attached pieces of art were taken by the British. (I would love to see a fight break out in this post’s comments about whether or not they were stolen!) Other remaining pieces were moved to the neighboring Acropolis Museum. Regardless, this is in every sense an ancient ruin, and visitors have to stay behind the roped-off area which is several meters away from the Parthenon itself. Nashville: Unlike the Athens version, this replica invites people to come inside! While it’s not made with expensive marble like Greece’s, it is structurally sound and fully intact. In addition, of the original Parthenon’s sculptures were replicated and displayed on this Parthenon’s exterior. In other words, it is not a replica of the Greek Parthenon as we see it today. Other than the material it’s made of, it looks exactly like what the Parthenon would have looked like shortly after its construction. Athens: Admission to the Acropolis is typically 12 euros, or free for those under 19. I was fortunate enough to be in Athens during European Heritage Days. During this last weekend in September, all visits are free! (A few other Greek holidays also provide free admission.) The ticket also includes admission to other ancient Greek sites around Athens, so this ticket alone may be your only expense in Athens besides, food, accommodations, and transportation. If you don’t want to see the Parthenon up-close (although I don’t see why you wouldn’t want to! ), there are several surrounding hills and buildings that offer a great view. Nashville: Normal admission is $6 for adults or $4 for children and seniors. There are sometimes events outside of normal museum hours that would involve a different rate. However, if you don’t want to go inside (again, I don’t see why you wouldn’t want to! ), no one can stop you from enjoying the exterior, and the rest of Centennial Park, for absolutely free! Unlike the other Parthenon, you can touch, walk on, and get up close to building at no expense. It’s even lit up at night like the original! The only caveat is that it’s not on a hill, so you can’t see it outside of Centennial Park. Which Parthenon would you like to visit next? Let me know in the comments! Although I am from Oregon, I can’t stand the rain! That makes coming up with day trip ideas complicated. But yesterday, my sister Jen and I took a very fun day trip along the Southern Oregon I-5. Since the majority of what we did involved being either indoors or in the car, the rain didn’t bother me at all! They’re bugs that are also bugs! This wasn’t a stop as much as it was a drive-by photo op, since these art pieces are on private property and meant to be viewed from the road. But it sure was nice to take a break from the interstate for a couple miles and catch unique scenery! By the way, I found out about these bugs from RoadsideAmerica, which I often use to find fun stops on the way to a bigger destination. Seven Feathers had five different restaurants! Only one was open for lunch on Sundays, so we enjoyed fried-pickle-topped sandwiches at Cow Creek Restaurant. In front of Seven Feathers is the largest bronze casting of an eagle in the world. Although Seven Feathers is a casino resort, we didn’t go there to gamble. When we entered, there was a blue line in the carpet separating the casino area from the restaurant entrance, which minors are not allowed to cross. Because Jen recently turned twenty, I had to tease her by showing off how I could go across the blue line! This was the goal of our trip! I had given Jen a Groupon for Wildlife Safari as a Christmas gift (they’re still available on Groupon if you want to snag one! ), and she finally had the opportunity to use it! Wildlife Safari in Winston, Oregon, is a drive-thru animal park. I’ve only been to one other animal safari (in Ohio), but Wildlife Safari is definitely unique in its own right. First, it is the only drive-thru safari in Oregon. It also has more unique animals, as opposed to mostly farm animals like at many locations. Best of all, it’s certified by animal welfare groups, so I can go here knowing that my experience won’t be detrimental to the animals. The drive takes you through three regions: Africa, The Americas, and Asia. I went here a few times as a kid, and I don’t remember being allowed to roll down car windows back then. This time, we were told at the entrance that windows down and seatbelts off were totally okay, as long as we didn’t get out of the car! This meant that some animals (especially the large bird species, like ostriches, emus, and rheas) would come up and poke their heads in to check out my car’s interior. Since there were wild animals, we got to see some of them fighting, and we may have cheered two bison on in their head-butting! No worries, though. Dangerous animals such as bears and big cats were separated from cars with fencing. At Wildlife Safari, every ticket is good for two drives through the safari. I think this is a great idea because we got to see and interact with some animals that were hiding during our first drive. Unfortunately, the one animal I was hoping to see that we didn’t see either time was the giraffe. We asked about it, and apparently they really don’t like the rain. I don’t blame them! But I think going on a rainy day ended up being a good idea, because the crowds were minimal and most of the other animals have no problem getting rained on. Wildlife Safari was definitely the highlight, but we had one more place to stop by in Winston. Noah’s Ark is located just across the street. It’s hard to miss since the building is shaped like a big boat and surrounded by wooden animals! They offer a restaurant and tour through Biblical history, which I may take advantage of in the future. But with an all-day excursion, we mostly just wanted to see what it looked like. It had a nice view outside and a decorated bookshop inside. After that, we headed home in the rain! This past weekend, I was finally able to get some real use out of my new car! Sure, I’ve taken it to work and to run errands, but it’s about time that it got to go somewhere fun out of town. And for about sixteen dollars in gas (which was the only expense of this trip), my friend and I were able to spend a fun and adventurous day looking for glass floats in Gold Beach, Oregon. Last year, I saw a TV ad from Gold Beach tourism. They announced that every week between February and April, they hide over 100 glass floats along their coast for visitors to find. If you find one, you get to keep it AND enter a drawing for a free weekend trip! I wasn’t able to make it out to Gold Beach last year. However, after deciding to buy my car this month, I began coordinating schedules with friends to find a time to head out to the coast. Steph and I both had time off this past weekend! (She was even the photographer of all these images because I forgot my camera and my cell phone was acting up over the weekend.) We headed out on Saturday morning. My car’s maiden voyage was a success. I learned a few new things about it, like where to pop the gas door, how to play music through the stereo with an auxiliary cable, and how to spray wiper fluid on the front windshield. The drive to the coast is beautiful. There actually isn’t a direct route west to the coast. Directions to Gold Beach led us into California and through the Redwood Forest before heading back up along the coast, which always makes for a beautiful ride. Along the way, we saw lots of interesting things that we made note of to stop by on the way back. It was past lunchtime by the time we made it to the coast. 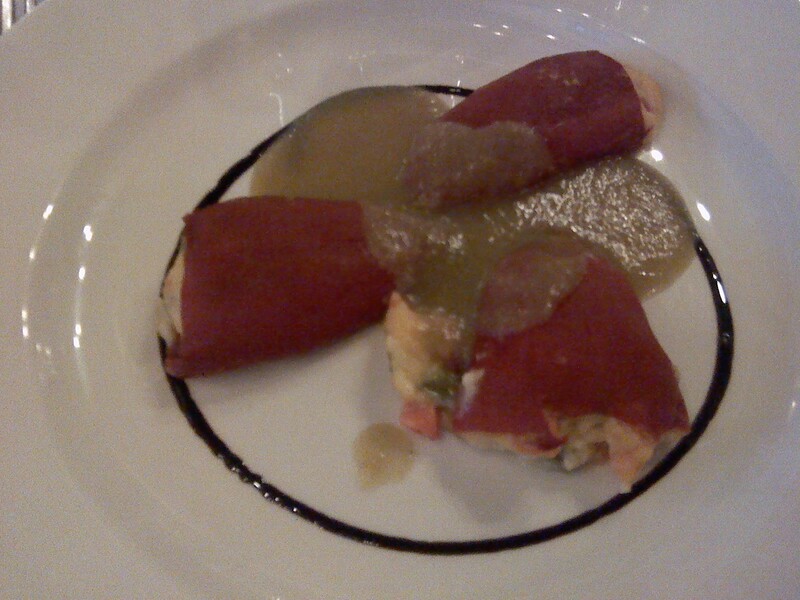 We considered the restaurant options, but decided to just eat what we had packed. We parked at the Gold Beach Visitor’s Center, which has a picnic area, bathrooms, and an information building. Inside that building, we were given a map outlining the perimeters for where the floats were placed. After eating, we started traipsing through the tall grass. We figured it was most likely in this area, because the tide covered most of the sand, and floats are not hidden anywhere that would cause them to be swept into the ocean. We looked under driftwood, in holes, and between rocks, to no avail. We saw other people searching, but no one who actually had found a float. After this hunting method resulted in only finding garbage, we decided to walk down to the jetty, which was a boundary on the map. We hoped that the further away we got from the Visitor’s Center, the more likely we would be to find something. On the walk there, I had to mentally prepare myself for disappointment. I knew the chances of us finding a float were slim, so I considered the alternatives. If we gave up, we could go shopping at some of the stores in town. If we spent at least $25 at certain stores, we just had to bring the receipts in to the Visitor’s Center and get a glass float from there. But that didn’t sound like as much fun as finding one on the beach for free. Fortunately, a glimmer of red caught my eye. It was a glass float! Not only did I find a glass float, but we ended up finding several all within a few minutes! The treasure hunt rules ask participants to only take one per person, so we left a few of them for others to find. Steph ended up with a small teal globe. I picked my favorite, a larger blue one. We slowly headed back to the Visitor’s Center (stopping to admire the beach and shoot photos on the lighthouse). The staff at the center told us that they were impressed that we were able to find even one that day as we filled out our contest entry forms. It hadn’t seem like we walked that far (until the next day when my legs were sore), and it also didn’t seem like we had been beach combing for that long. 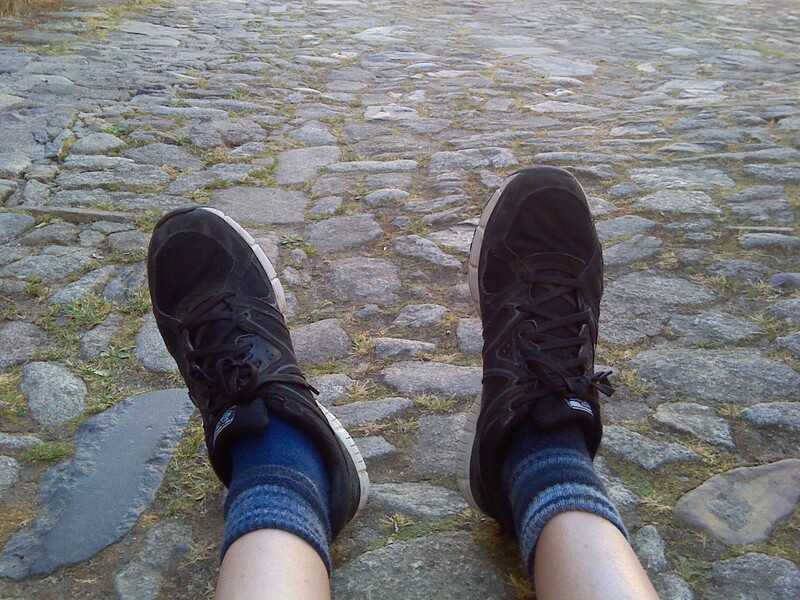 But we had walked several miles, and were out for about three hours! I didn’t realize this until we hopped back into the car and saw the clock saying it was 4:30. But we still had enough daylight to see the things we wanted to see on the way back. We didn’t stop in the nearby coastal town of Brookings, but as we drove through it, we got a good look at the sinkhole that’s slowly taking over the highway. That was pretty scary! We also drove over Oregon’s highest bridge and saw a huge herd of wild elk. Our first actual stop was near the redwoods, on a nature trail with carnivorous plants called Darlingtonia (pictured in the marsh above). The second stop was just a couple of miles down the road at a waterfall. I would tell you what this waterfall was named, or really any information about this waterfall, but I can’t. There were no signs or plaques, so it’ll just be called “The Waterfall We Saw On the Way to Gold Beach”. There were several other places worth seeing through the comfort of the car window. If you’re visiting from further away, some of them may be worth stopping at, but we’ve grown up with the sights of the giant redwoods and the mountain roads that twist, turn, and tunnel. While I’m not sure if we’ll be so fortunate in each finding a glass float in the future, I do hope to do this again and encourage you to try it out, too! Click here for more information on Gold Beach’s annual three-month treasure hunt! Before even watching the movie “Letters to Juliet”, I was excited to go to Verona as part of my Mediterranean Trek. So I planned out my visit to this city mainly by borrowing the movie from a friend. The only mistake I made was that I booked a mere two nights in Verona, leaving me with just one full day to experience all that this quaint city has to offer. My first night in Verona was spent arriving by a delayed train, then struggling in the dusk to find where my BnB was before finally giving in and taking a cab, so I didn’t see much in the midst of that stress. I started the next day bright and early with a walk to Juliet’s courtyard. This is what you see in “Letters to Juliet“, and it’s the perfect place to write a letter to Juliet! Because I got there early enough, there were only a few other people there. I found a quiet place by the grafitti wall of love to write my letter. In the movie, you can see women sticking their letters into the cracks of a wall. You can still do that, however, to make sure that a secretary of Juliet receives your letter, there are better practices in place now. The best thing to do is stick your letter in the red mailbox. Alternatively, if you go inside the house, you’ll find computer kiosks where you can e-mail her! I wasn’t sure if I wanted to go inside the house at the time, so I headed over to the area where you can find Juliet’s tomb. It turns out that you can get a discount by getting a combination ticket to Casa de Giulietta and the museum with her tomb, so I did that. The tomb was the best feature of the museum it’s housed in, but there are other art and artifacts to enjoy as well. I eventually went back to the house, Casa de Giulietta. Inside were a lot of artifacts from some of the Romeo and Juliet movies, such as costumes and a prop bed. While foot traffic inside the Casa wasn’t so bad, the courtyard was getting jam-packed with tour groups and other visitors. Here’s a tip: If you want a truly magical and meaningful experience with Juliet, go in the morning before the day trippers roll in! I went to the courtyard for a third time in the evening, and it was even more crowded then! But this is when I enjoyed putting my own graffiti on the wall entering the courtyard. I’m not a vandal, it’s actually encouraged! There are a lot of other things to do in Verona, such as go to the Arena, walk by the river, or explore the castles. I did some of these things, but since none of them are directly related to Juliet, I’m going to fast forward to today. I had heard it would take a long time to get my letter back from Juliet. I was hoping it would arrive to my house around the time that I came back from the Mediterranean, but such was not the case. I kept it in the back of my mind, and thought about it sometimes when I went to get the mail. But today, I was totally not expecting it! I opened the mailbox and grabbed the letters out. One had an Italian postmark, and the return address said it was from “Club di Giulietta”! I squealed in excitement. I scared my dog by my squealing. I hope the neighbors didn’t hear me squealing. I raced back to the house so I could carefully open the envelope. I don’t remember exactly what I wrote to Juliet, but it was a decent-sized letter that could be summed up as “where is he?” I was honestly just expecting the response to be a canned sentence on an index card. I was surprised at how much thought was put into the letter I received! Here are a few of my favorite quotes from the letter. In an age where it’s rare to receive a beautifully handwritten letter, it’s even more special to receive one from a fictional character! Two days after returning home from my 92-Day Mediterranean Trek, I invited some people over to my house for a Mediterranean Night. 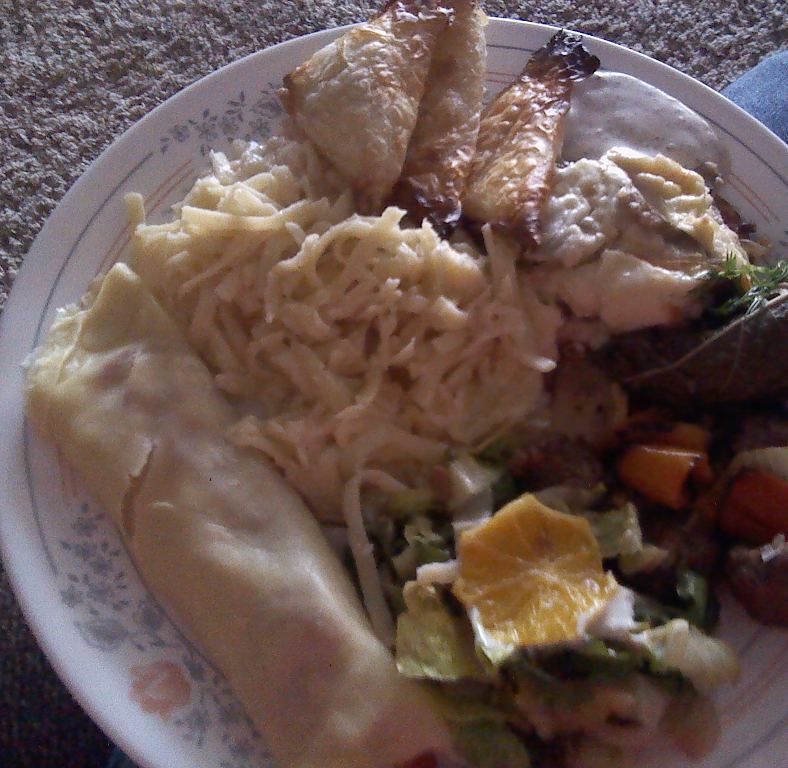 This involved a potluck of Mediterranean or European-inspired foods (many of which were left at my house and made delicious leftovers for the next few meals), and also featured a slideshow with over 200 of my trip photos. (This didn’t seem like many compared to all the photos I actually took!) It was a fun way to show and tell my experiences with many people who would be questioning me about my travels anyway. And while it just took place in a living room, it kind of felt like I was back in all those exotic cities, but this time I had friends and family right alongside me! 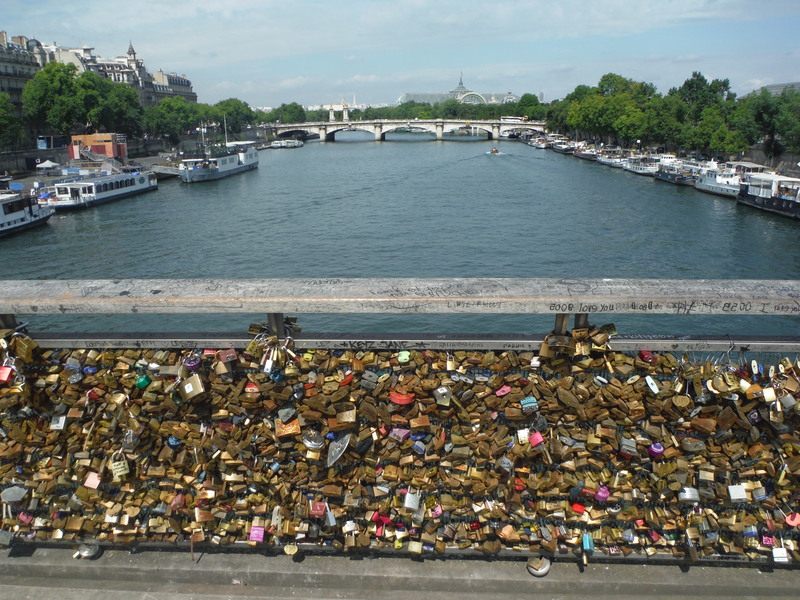 We discovered the evolution of the bridges over the Seine River and debated the merit of Love Locks. 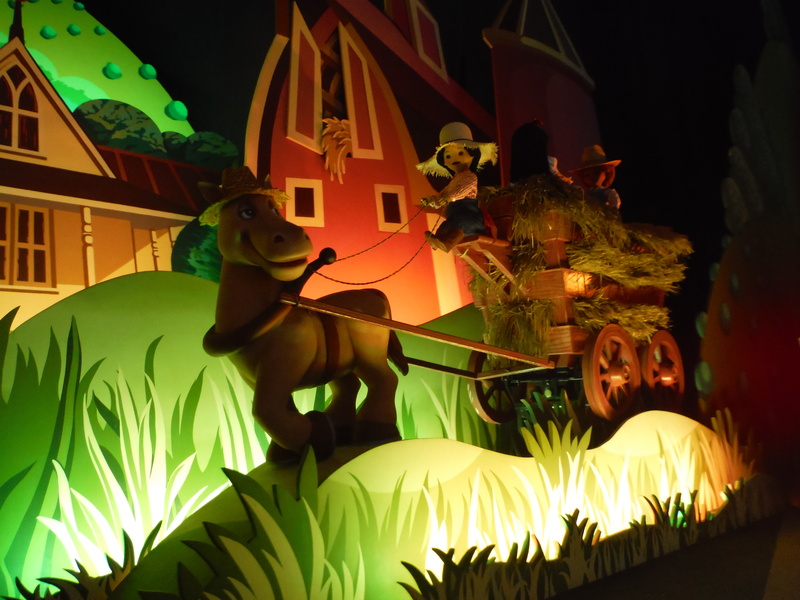 We laughed at how Disneyland Paris portrayed our American culture in It’s a Small World After All. 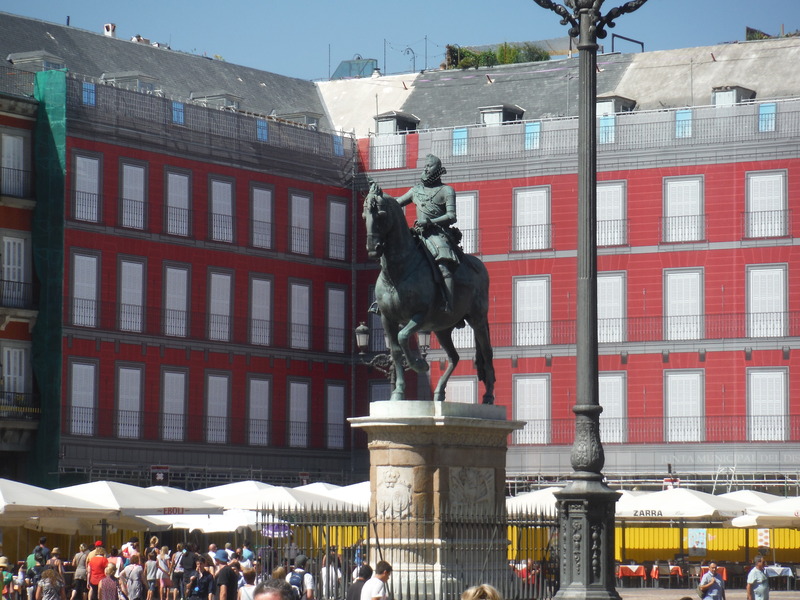 We cringed in disgust from stories like how this horse statue in Madrid was once accidentally a death trap for birds! They watched as I learned how to properly carve ham right off the leg…even if I didn’t want to eat it! 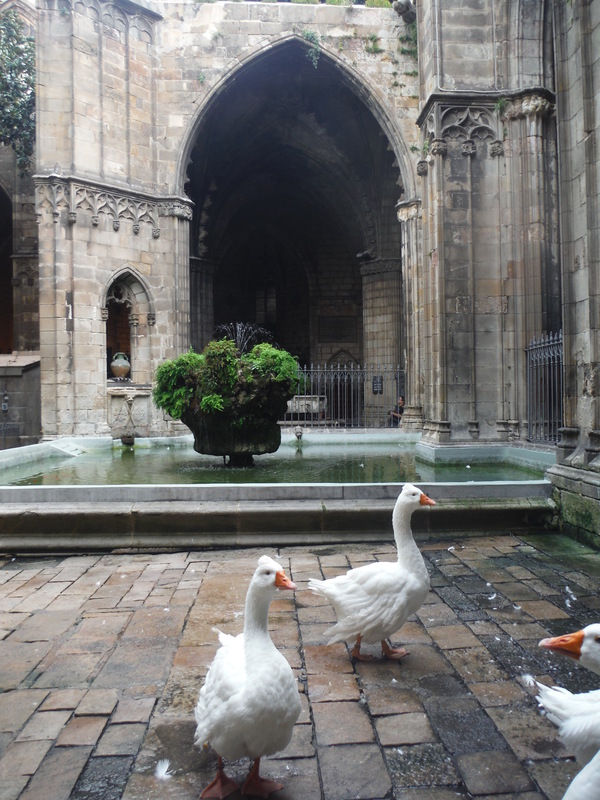 We questioned why this cathedral in Barcelona keeps 13 geese in the courtyard and whether or not the legend behind it is true. 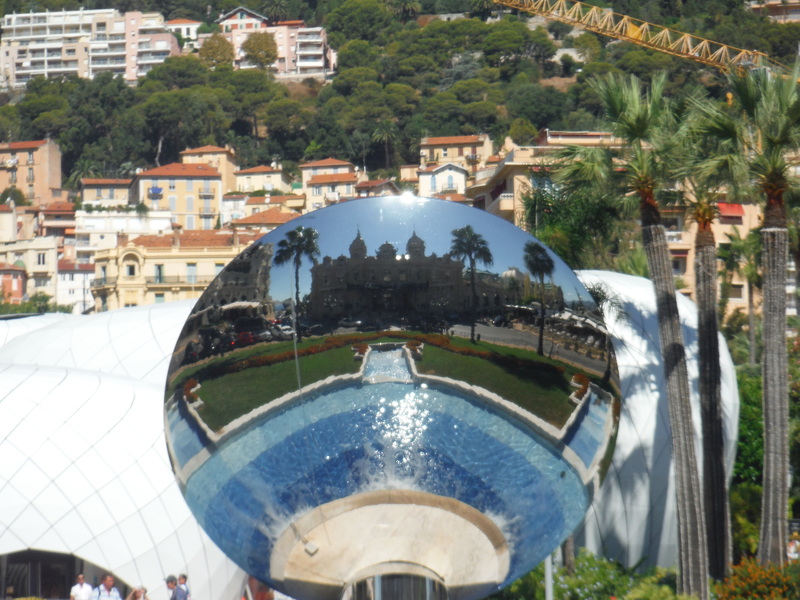 We marveled at the scenic landscapes of every city, and even the world’s second smallest nation of Monaco! 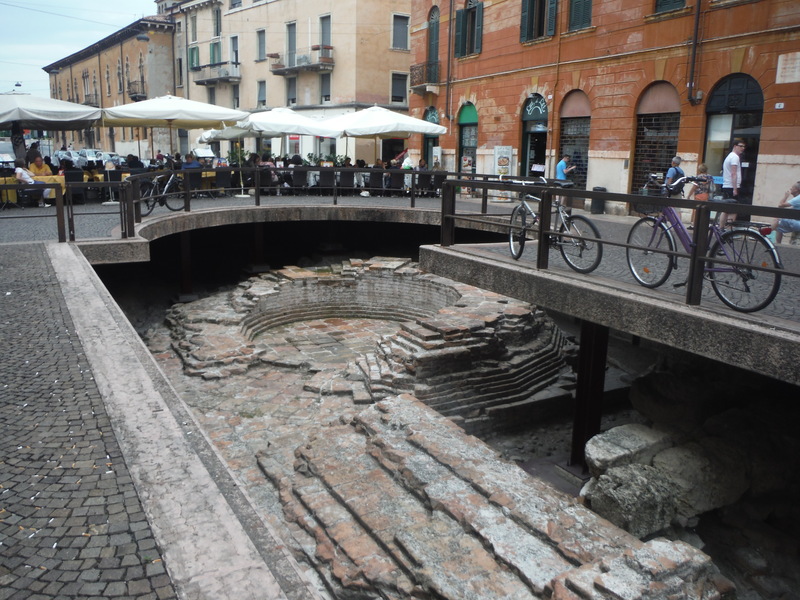 We were fascinated how places like Verona could just casually house so many millenia-old buildings and artifacts! 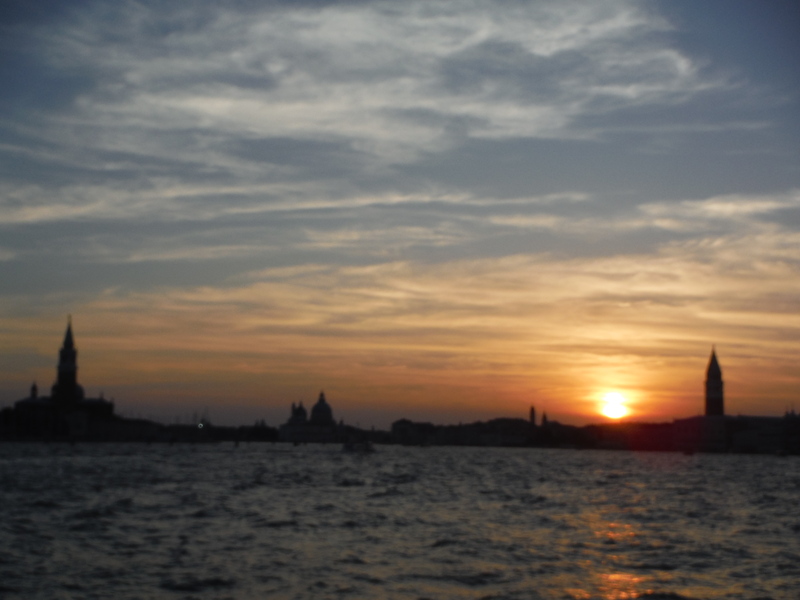 We shared a sunset over Venice. 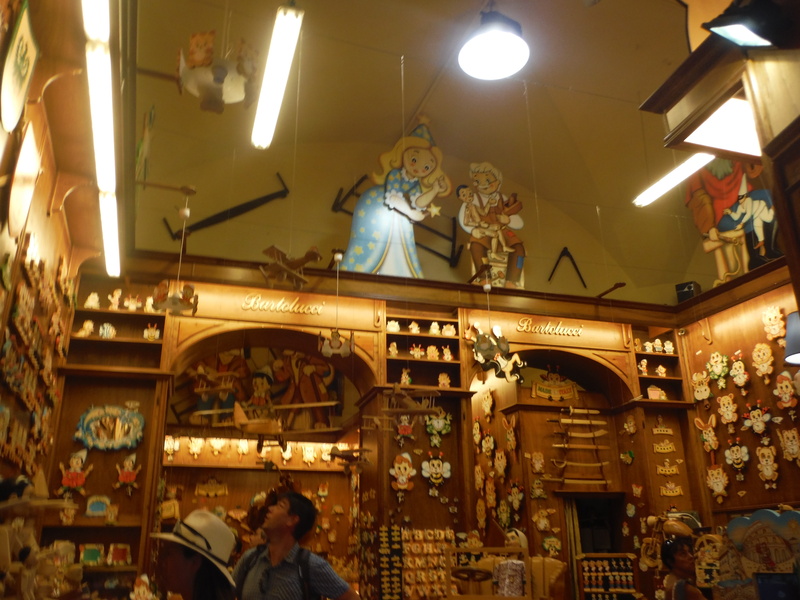 Pinocchio and Gepetto’s workshop came to life to us in Florence. 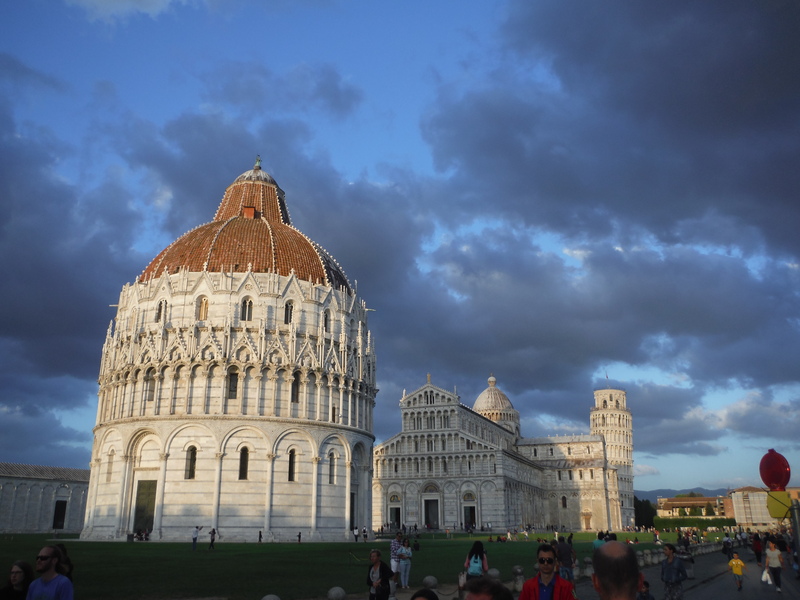 We wondered why the Leaning Baptistery of Pisa doesn’t have the same fame as the Leaning Tower of Pisa! 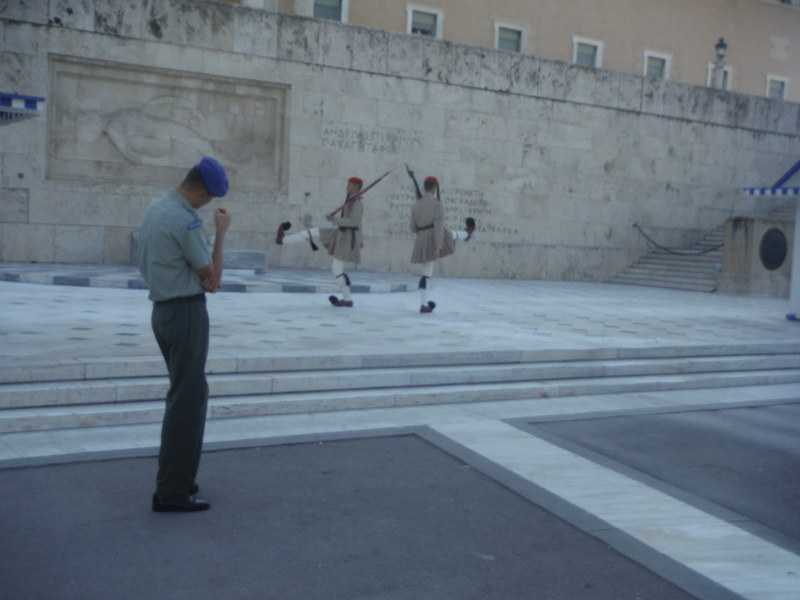 We questioned if the guards at Athens’ Tomb of the Unknown Soldier was really a reverent location or more of a fun tourist stop. 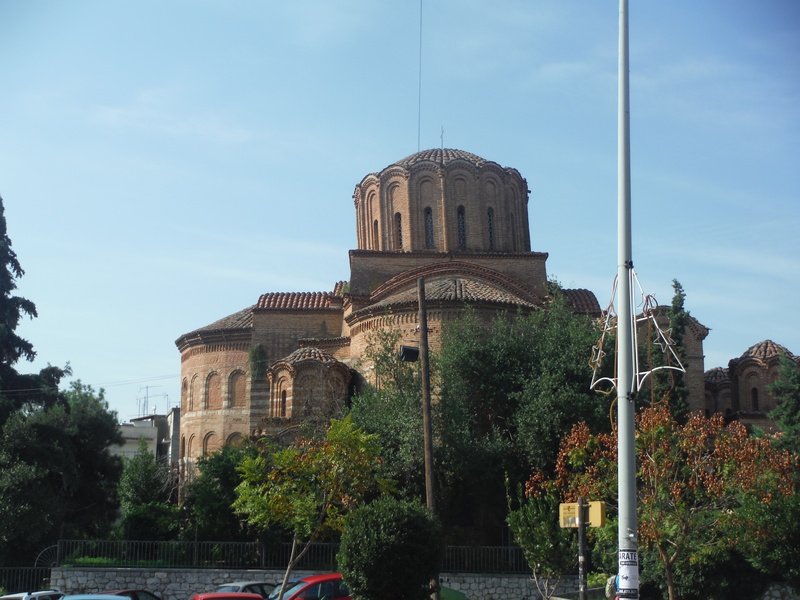 We learned that Thessaloniki has its own leaning church akin to Pisa’s! 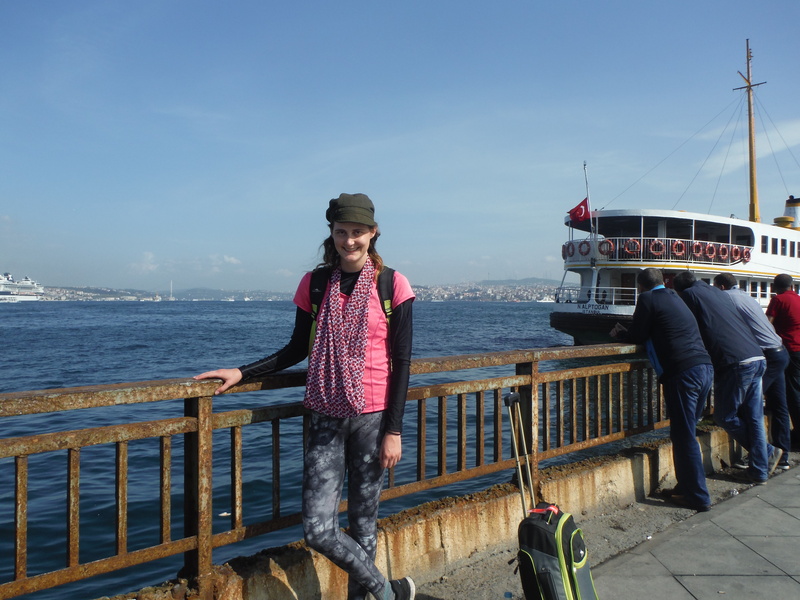 And we finally left Europe with a boat ride to Asia in the intercontinental city of Istanbul. I know I couldn’t invite that many people into my parents’ living room for a night of personalized armchair travel, but over the next several weeks, I would like to invite everyone to journey with me for the inside experience of backpacking the Mediterranean, just like the ones mentioned above. We’ll explore each city together and have some fun along the way. Will you join me in reliving this Mediterranean Trek? 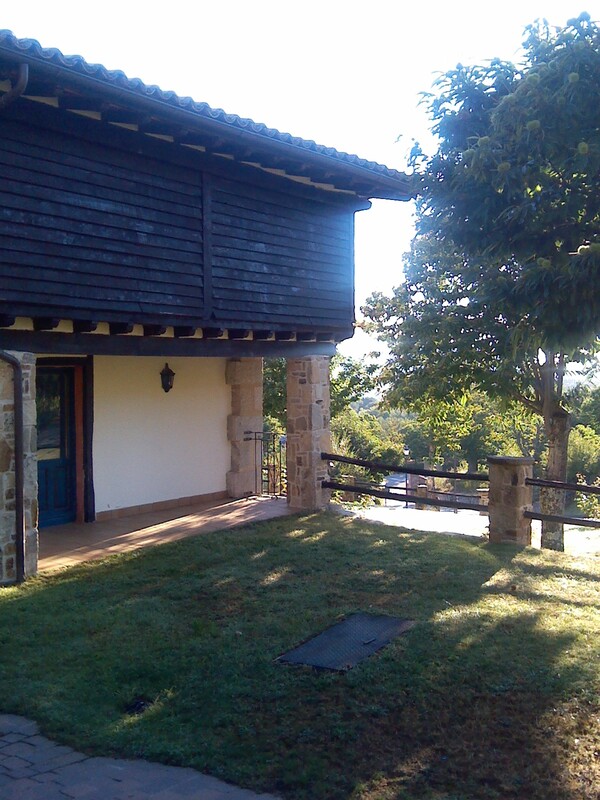 There is a place in Spain that offers a nice break from large cities like Madrid and whisks you away to forest-covered hills and mountain views. Here you can enjoy three-course meals, pool facilities, and a retreat to a villa. Best of all, you can get this for free. The catch? At this Spanish location, no Spanish is allowed! This shouldn’t be much of a problem for native English speakers, but each of these people, referred to as an “Anglo”, will have to spend all day talking with native Spanish speakers who want to improve their English. The English-only rule is a bit more difficult for the Spaniards! In order to expose the Spaniards enrolled in the program to different accents and expressions, the program, called Pueblo Inglés, recruits Anglo volunteers from places like England, Wales, Ireland, Australia, and Canada. I was one of the volunteers representing the United States in a recent program. Volunteering does require putting in long hours of sometimes difficult conversation. Most of my day consisted of talking one-to one, having group discussions and partipating in activities that somehow helped practice English. But in return, I received transportation from Madrid to a scenic resort, three-course meals and a stay in a villa all for free! Of course the Spaniards do have to pay for this language learning experience, but it is an incredibly effective program as it is an intensive eight days of speaking nothing but English. I saw many people who started the program having difficulty understanding me even when I was speaking slowly, but towards the end of the week we were chatting like I would with someone from home. Over the course of the week, Anglos and Spaniards do everything together. At meals, each four-person table had two Spaniards and two Anglos. 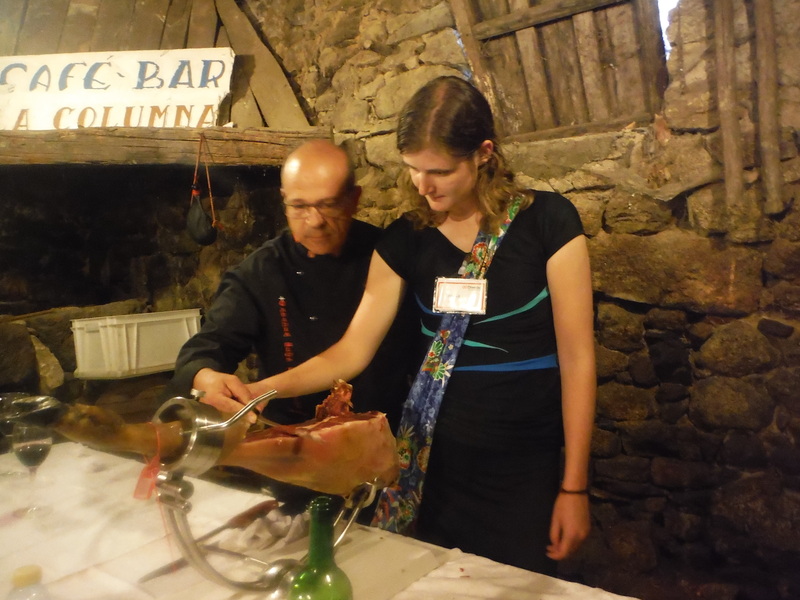 Group activities included discussions, icebreakers, parties, and even a tour of the nearby town La Alberca. Now THAT is an experience I must tell you about! Most of us chose to walk from our hotel to the town through a backroad. On the way, our master of ceremonies told us about the La Alberca black pig. This area is famous for their ham, and one way they promote it is by having the community raise a pig each year that roams around town. We were warned that the pig isn’t always in an easy-to-find area, but at that point I was praying for a special experience of finding the pig! And boy, was that prayer answered! After looking at few of the notable La Alberca sights, our group sat on the cathedral steps a block away from the town square while we listened to the beginning of a story of an earthquake in the town. Suddenly, someone sitting in the back began shouting. 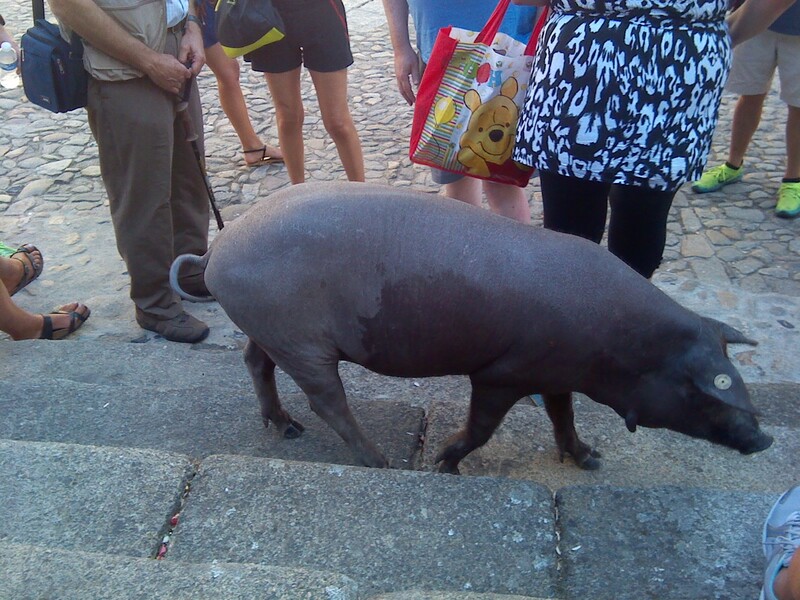 Among other choice words, he notified us that there was a pig climbing up another set of steps. 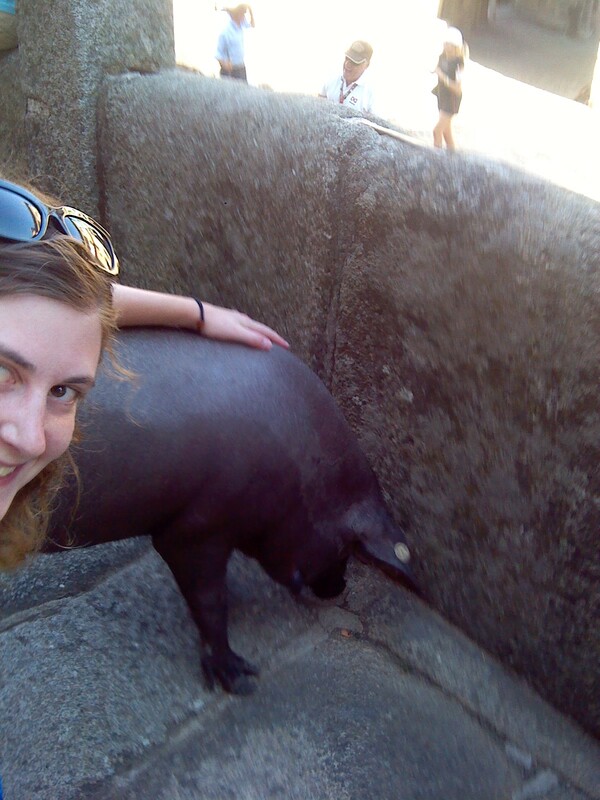 Of course, the story had to be paused while we all attempted to take a selfie with the famous pig. But after a few minutes of trying to get the pig to smile, out MC convinced us to sit down again as the pig started to wander away from the excitement. Little did we know, once we were settled down, the pig wanted to cause some chaos. She wandered up behind us. Then, she decided to root for food right where I was sitting! I never expected to get that personal with a pig! But it only got worse. Since she couldn’t find any food underneath me, she did a taste test of me! She bit the closest part of my body she could find. Since I was trying to stay seated on the step and not interrupt the entire group, there was one particular body part right next to her face. At this point, there was no way that the group wouldn’t be disrupted as everyone was already pointing and laughing and getting out their cameras. The pig continued to make her way through the group, sampling the bags and shoes she came across. Our MC finally hollered, “Forget about the earthquake story; let’s move this way and leave the pig!” The rest of the tour finished the way a normal walking tour typically does. 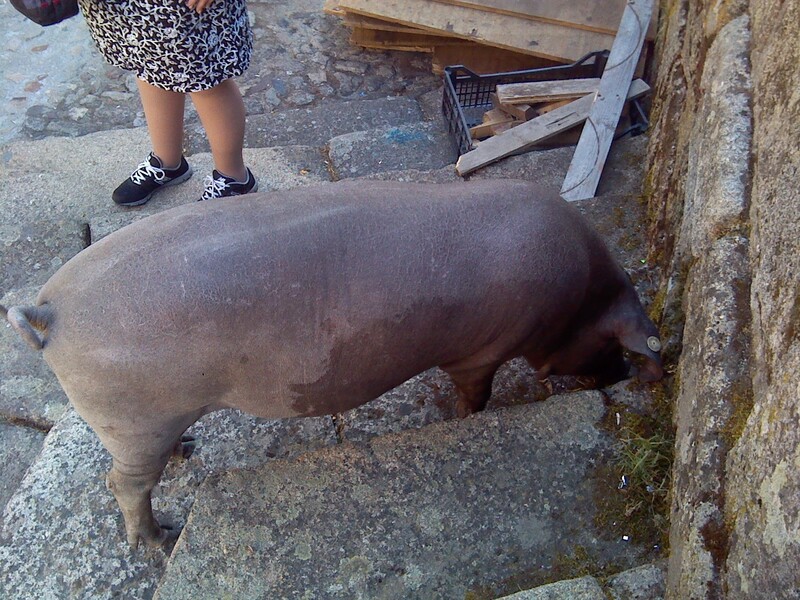 When we had some free time after that, I busied myself exploring the cobblestone back roads, but from a distance I spied the pig, who had found new victims to harass. To continue our time in town, we were treated to a wine, cheese, and meat sampling where we learned the secret way to cut the perfect slice of ham straight from the leg. 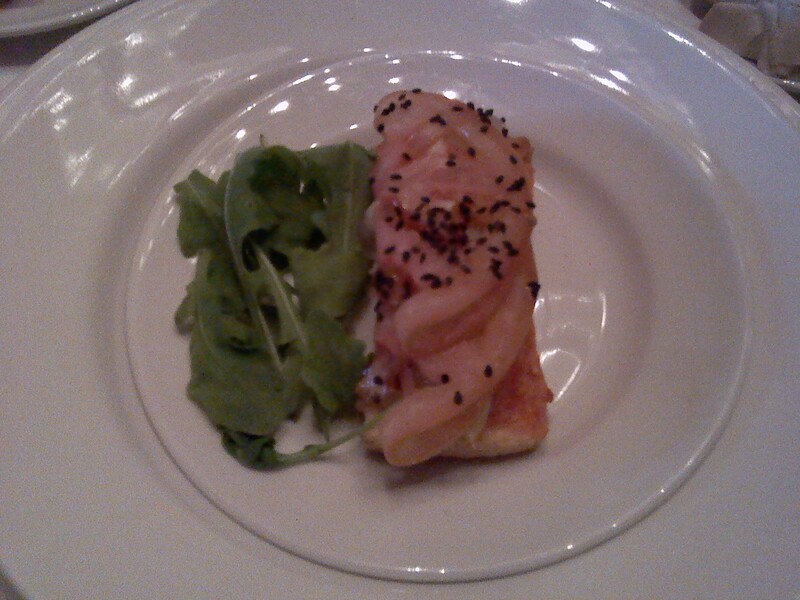 I dont normally eat pork, but since the pig tried eating me, I sought my revenge by eating a tiny bit of pig. 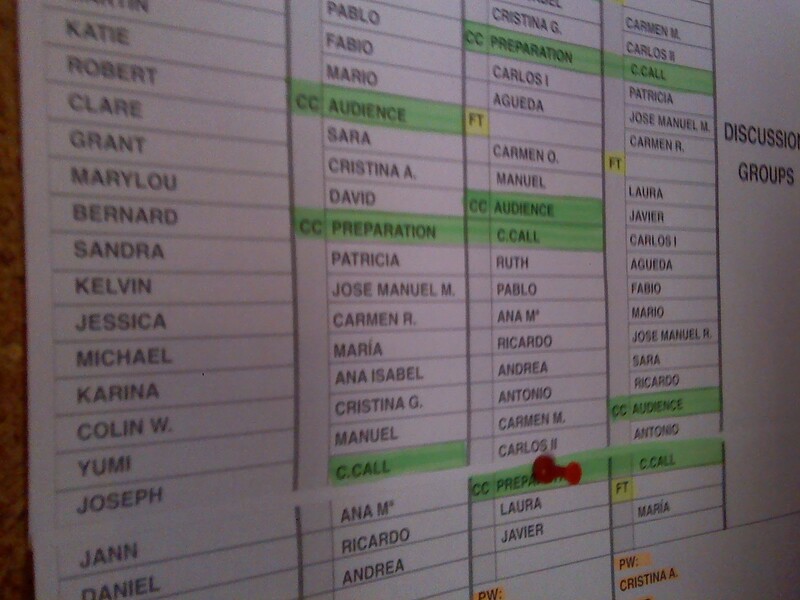 I just finished my last day of Pueblo Inglés, and it was surprisingly hard to say goodbye. 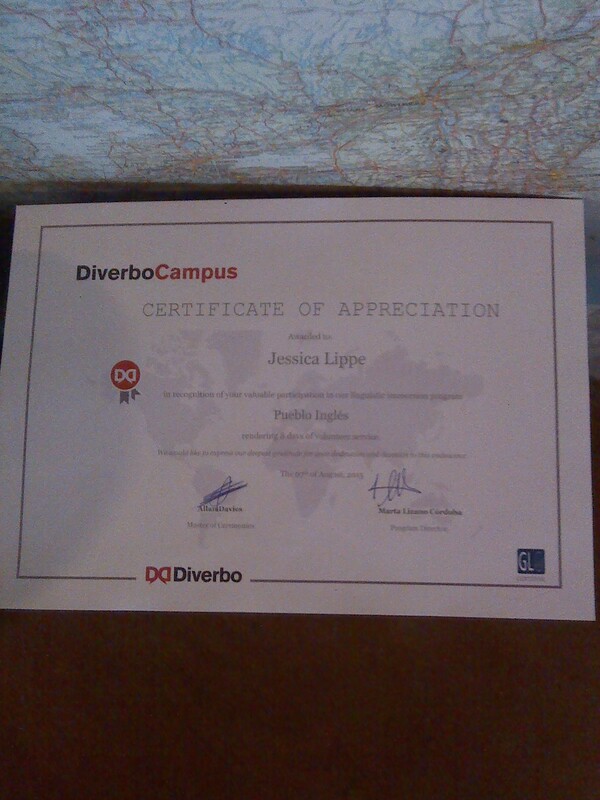 I had come to teach the Spaniards English, but they taught me even more about the world and life in general. The week had a feeling akin to an adult summer camp, so along with that came the kindling of new friendships that I believe will last a long time. I hope to see many of them again, either by traveling to their home country or by inviting them into my home. And I may have to attend another program in the future! Spending a week volunteering (or possibly enrolling in) Pueblo Inglés may be one of the most meaningful and most fun things you can do in Spain. Just make sure to keep a safe distance from that pig’s snout!